Synopsis: Poems about family and memory, in particular about the historical violence done by slavery; about my own family, a slaveholding family in Virginia from 1670-Civil War; about trying to make sense of this all from the odd vantage of California; about what it means to inherit this particular legacy, but also any legacy at all. I believe that in some way all books are project books, but I think the question is just how the project gets articulated, understood, defined. To write books that call us, we as makers each end up having some sense of order or wider purpose, which leads us onwards. This book started as poems that were meant to interrogate my fascination with family legends, the stuff up in attics, but also with what family histories do and do not contain, what they leave out. But poems also presented themselves as part of this collection that I didn’t understand, that had subterranean lyric tie in. I wrote poems that called to me and then kept laying them out, asking it how it all fit together. These were poems “about” family, but there were a deeper set of questions I was working out here. I was exploring how I see the use of family, as I use it in this book, as a proxy for inheritance—the ways that any inheritance (from culture, from literature, from family) is problematic. I was looking at history and inheritance and family story as sort of haphazard, blurry, full of absence, as well as presence. The absences are political. The absences represent violence and forgetfulness. We cherish some of these hand-me-downs, but they are also confusing and—in some cases—morally ambiguous. The Forage House contains at least two registers of poem, though sometimes the two themselves are blurred: There are poems of family hand-me-down and legend—the kind of thing your grandmother tells you on the porch after a couple of gin and tonics, and there are poems that use the record book, or the archival will, or the document that includes strange or haunting absences. I was exploring how we try to listen and see through both these kinds of records. Are you comfortable with the term “project book”? Only partly. It seems to me that it’s been used in a kind of derogatory way, as if the people who write them are dutiful propagandists. I guess I think starting out with too fixed an idea of what should emerge is a bit aesthetically dangerous. We learn by going after all. We act out of and write into constellations of concern. I think one can set out to try to write in a direction, but if one is leaning into the poem, into language, into that charged space of music, one—the ego, the planning self—isn’t really in charge. I’m not saying the project book doesn’t have some uses. We all need to be able to describe our work quickly to others on elevators, on grant applications, and so on. But I think having a sense of being able to describe a shape or an aim is different than being too dutiful when one is writing. When you’re writing often the most important thing is to be surprised. Was your project defined before you started writing? To what degree did it develop organically as you added poems? This is a complicated one. I am a white descendant of Thomas Jefferson. So I had a lot to write about in terms of my own learning about that inheritance, especially the moment when our family learned about the DNA evidence from Sally Hemings, and about how I began to think more about the legacy of slavery in my own family. I knew I wanted to write about this. But how was confusing. I actually thought I was going to write a straight nonfiction book. I wrote grant applications under that guise. And I got grants to work alongside archaeologists and historians at various historic homes. This was literally a reporting project—I was going out on archaeological digs and into closets that held 17th-century artifacts. The thing was: when I actually confronted the material, I found it so charged, so shard like, so painful. I ended up finding that I kept being drawn to this jagged nature of the items I’d see. And I’d take these notes that came out like painful little songs, little poems, little jagged shards. So rather than surround this experience in prose, I began to feel that poetry—which dances with absence—was a much richer form to use to describe the experience of being in dialogue with these relics. Poetry helped embody the mystery of things, the enormous strange absences around the objects themselves. Did you allow yourself to break your own rules? I didn’t have rules. I tried to write anything I could that felt connected and then to sense my way towards editing that material into a shape. I always think each poem should stand on its own. I also think the whole of a book should be an arc that somehow itself reads like an extended poem—one that has many fine autonomous parts. In order to think about constructing the various pieces I spent time with other art that is constructed out of disparate parts—Rauschenberg, for instance, where there are many disparate elements the art object somehow unifies, or with certain crazy quilts, where the art emerges out of the careful and mindful piecing of divergent scraps. At any point did you feel you were including (or were tempted to include) weaker poems in service of the project’s overall needs? This is a risk, and a common critique, of many project books. How did you deal with this? Oh, you just have to keep editing, and have good friends to read with you. One should always let weak poems go. But as you scrap a weak poem it is worth asking: What was it standing in for? What in fact does need to be said there? Sometimes a weak poem is doing something narrative, or providing facts or backdrop, or setting a scene. But you say, ok, what else now? Usually there’s a better or more animated way to do the same work. Did you fully immerse yourself in writing this project book, or did you allow yourself to work on other things? I began this book in earnest in 2006 and I sent in final copy in 2011. During those years I worked several jobs, took artist’s residencies, got married, moved across the country, and became pregnant with my first child. Sometimes I had a grant or residency that really helped me make incredible progress—like at the Amy Clampitt House, where I could basically work every day. Other times work would languish except for brief weekly check-ins. I did always know I was working on this book and I kept resolving that somehow it would be finished. There was one older poet who said some disparaging things at the beginning. She really made me feel bad, but I think she was telling me something that I basically now believe, which is that you can’t be too dutiful in writing poems. You have to figure out where the life vein is and follow it, rather than giving yourself assignments and turning out dead poems in response to those assignments. Write other poems if you have to. Sneak up on the poems you need to write or let them sneak up on you. What I think she meant was that a sense of form or subject is a place to start, but you actually have to be surprised by the material you are creating. Later, there was a period when I got nice rejection notes and finalist notes from many contests. I had received praise from other mentors and friends. I knew I was close, but I felt like I was going to be “close but no cigar” forever. I got discouraged but I just kept going. Somehow I channeled this place of calm and patience at the end. At times it felt almost otherworldly. Just have faith. Just keep going, revising, sending out, trusting that you’ll see some outcome. Again, I didn’t WANT this to be written off as a “project book” in a derogatory way. I think there’s a lot that goes into it that’s unified by some subtle threads that don’t really make it into a blurb jacket or elevator pitch or grant application. But I tried to be pragmatic about this. I kept thinking—there’s the way we describe the book in order to market or sell it, and the actual charged mystery of how a book is held together. Do you have a sense of whether the fact that this is a project book helped position it to find publication more easily? Has it helped you find readers? I thought about it in terms of place, in terms of demographics, in terms of how I would share this excitement with an audience. I do think that the fact that this book circles through the legacy of Thomas Jefferson—that he weaves through the book—helps it find a certain kind of audience, and it certainly was a certain kind of selling point. I also know that I can talk about this book as it deals with history, with memory, with family, with violence. The book explores documentary poetics. In some ways it is also a book about North Carolina mountains and about California, where I grew up. A lot of my readings have been place based—I’ll read poems in the places they are for, and people in those places respond to them. People have their own reasons for connecting with it. I’m drawn to good books. I’m a critic—I do a lot of reviewing—and I have to say that I never know from the outset what “kind” of book I’ll like. It has so much less to do with form or subject and so much more to do with internal wit and verve and music. I’d say: Don’t write a project book. Write a good book. What effect do you think the prevalence of project books is having on poetry in general? I think, again, we all live in a moment where there’s this pressure to justify ourselves and describe ourselves, either to others, outside the field, or on grant applications, or to one another at cocktail parties and conferences or at department lunches. We all want to sound like we’re really “doing” something. So having a project, well, that really helps—especially among other academics and that sort of person. There’s nothing more embarrassing than saying “oh, well, I’m just a lyric poet and I read other poets and I wait till I suddenly feel a bit of inspiration, usually after eating a cheese sandwich, and then I try to write something that responds to that inspiration.” I mean, that may be true. In fact, I think that’s much more the real truth of it, but it SOUNDS embarrassing. So we often say that we’re working “on a project about our Scottish ancestors” or “about detectives” or “about doctors who develop antibiotics” or “about cities.” That said, having this kind of project isn’t necessarily a bad thing. I mean, any one of those projects can get you started researching, which gets you out of your mere head and in contact with strange and possibly generative materials and people. You can encounter strange words or ideas and foster interesting daydreams. And then, something interesting can start to happen. For me, many of my poems are about the sheer excitement of being in contact with archival materials, and through them trying to access the mystery of the past. And I know that sometimes a day looking at art or a history exhibit offers more than any nice lazy day eating cheese sandwiches could provide. But I do think we partly are afraid of the loafing and imagining time that seems sort of useless—and sometimes we rush to describe projects as a way of seeming to be doing Something, with a capital S. So I guess I also come down in favor of cheese sandwiches, lots of books. As a teacher, how do you see the prevalence of project books and other poetic constraints affecting your students’ writing? I would always love for my students to attempt poems on any and all subjects that call them. I think learning to explore forms and modes and voices is more important than settling into subjects right away. I mean, try a sonnet. Try an ekphrastic. Try to imitate or retell Ovid. Try to put John Donne in your own words. Try to write a letter back to Adrienne Rich or Mussolini. See what happens. Do this a bunch before setting out on a project. Have you abandoned other project attempts? How did you know it was time to let go? What happens to project poems that never amass a full-length book? You know, I had my son so shortly after this book got accepted and I had one other book coming out fairly soon and I have lots of stuff that isn’t finished but I don’t know if it IS abandoned, yet. I mean, who can know? Life is long. I keep all my notebooks. After completing a project, how did you transition into writing something new? What are you working on now? Another project? 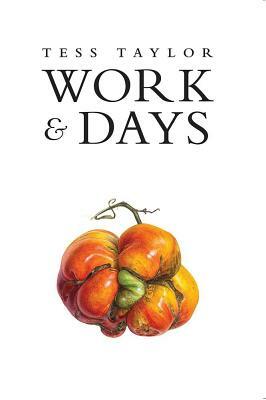 Actually, my next book–called Work & Days and due out this spring–is itself a project book, but it is a very different kind of project. While I was at Amy Clampitt’s house in the Berkshires, even then finishing revising The Forage House, I ended up breaking up my writing week by interning on a farm. I’ve always been an avid gardener, but I ended up spending days in the field, weeding, planting, working the greenhouse. The musings of these work days made it into a cycle of poems. The title comes from Hesiod, the Greek poet who was writing anti-epic farm poems while Homer was composing the Odyssey. And indeed, these are kind of anti-epics, or poems that explore what it might mean to try to experience one place now. So I’m playing with genre, too. In this second book I wonder what it means to adapt this old genre of farm poem to the world we live in now—how to be close to nature in this moment of impending ecological catastrophes. It’s a very different sort of book than The Forage House. It’s quieter, and more simply chronological. It traces January–December of one year on one plot of land. It’s about trying to be an observer, and about trying to belong. Begin by writing lines that intrigue you, then poems that intrigue you. Read poems that inspire you and respond to them. Watch the world around you and pay attention to yourself watching. Don’t worry about the big picture too soon. Learn from what details have to teach you. If you’re interested in a subject, read about it, read lots, and then let yourself daydream. Find a strange angle. Write the poem you’re thinking of writing a couple of different ways. Set up rules to follow but be comfortable breaking them. Take lots of walks.